alaTest zebrał i przeanalizował 1303 opinii użytkowników z magazynów i stron. Ludziom podoba się rozmiar i cena. Przenośność jest również bardzo dobra. Ludzie mają wątpliwości co do wykończenia. Eksperci oceniają ten produkt na 81/100 a użytkownicy na 87/100. Przeanalizowaliśmy te oceny, wiek produktu i inne czynniki. W porównaniu do innych produktów z kategorii Kamery wideo, Sony HDR-AS100V / AS100VR uzyskał ogólny alaScore™ 92/100 = jakość Celująca. Third time's the charm? Sony's Action Cam AS100V has plenty of features to beat the GoPro Goliath at its own game. High bitrate recording and a bunch of extra features like GPS make this Sony's best Action Cam so far, with good still image and audio quality added to the mix. A new tally light on the top of the camera makes it easy to see when you're recording. The live view remote can't be used for photo or video playback, and a microSDXC card is needed for high bitrate recording. Exposure during regular 28Mbps video recording is uneven, while water tends to cling to the front of the waterproof case. Sony's Action Cam records decent video in bright situations, has useful image stabilization, and works with a pair of well-specified apps, but the camera suffers in low-light environments. Lightweight, streamlined design. Well-designed mobile app. Decent video in bright environments. Image stabilization. Video quality suffers in low-light situations, even on overcast days. Shallow water depth limit. The POV Action Camera HDR-AS100V/W is a life camera with HD video recording. However, the body style does not work with most harnesses, so it is mostly suitable for wearing on a helmet or holding. 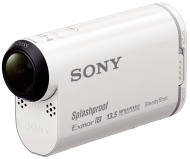 Im Kampf um den Titel der besten Action-Cam geht die neue Sony HDR-AS100VR ins Rennen. Kann sie die GoPro Hero 3+ Black Edition vom Thron stoßen?